Glaciers are flowing masses of ice, created by years of snowfall and cold temperatures. Approximately one-tenth of Earth is covered by glaciers, including Antarctica and parts of Greenland, Iceland, Canada, Russia, and Alaska. Mountainous regions on every continent except Australia also contain glaciers. Glaciers have enormous powers to reshape the face of Earth. Even today, glaciers are altering how our planet looks, and they hold clues to its past and future. Glaciers are created in areas where the air temperature never gets warm enough to completely melt snow. After a snowfall, some or most of the snow may melt when it comes into contact with warmer ground temperatures. As the air temperature drops, the melted snow refreezes, turning into small ice granules called firn or névé (pronounced nay-VAY). As additional layers of snow accumulate on top, the firn underneath is compacted. When the accumulation reaches about 150 feet (46 meters) deep, the weight and pressure cause the lower layers to recrystallize into solid ice. As years pass, snow accumulates and the slab of ice grows steadily thicker. Eventually the mound of ice becomes too massive to sit still, and gravity pulls the ice downhill. Once the ice begins to move, it is considered a glacier. Glaciers that flow down a valley from high mountainous regions usually follow paths originally formed by rivers of snowmelt in the spring and summer. These valley or mountain glaciers end in a valley or ocean, and tend to increase the sharpness and steepness of the surrounding mountains along the way. In the Alps, a mountain system in south-central Europe, there are more than 1,200 valley glaciers. Piedmont glaciers are large, gently sloping ice mounds. Also known as lakes of ice, piedmont glaciers form when a valley glacier reaches the lowlands or plain at the foot of a mountain and spreads out. These are common in Alaska, Greenland, Iceland, and Antarctica. Glaciers that form in small valleys on the sides of mountains are called ice caps. Found in Norway, Iceland, Greenland, and Antarctica, ice caps usually do not move out of their basinlike area. The largest form of glacier is called a continental glacier, a huge ice sheet that moves slowly outward from its center. Ice sheets may cover hundreds of thousands of square miles, and are so heavy that they cause the rock underneath to compress into Earth. The largest continental glacier is found on Antarctica, where the ice is more than 2.5 miles (4 kilometers) thick at its center, and hides entire mountain ranges beneath its surface. It extends more than 5 million square miles (12.9 million square kilometers). The Antarctic ice sheet accounts for 90 percent of all the ice in the world, and contains more water than all of Earth's rivers and lakes put together. 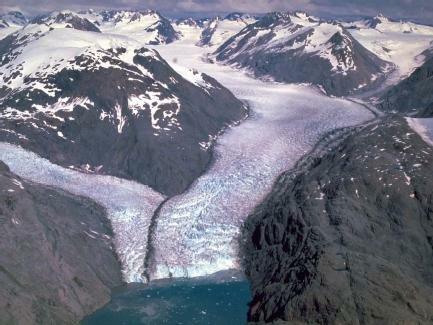 Continental glacier: The largest form of and slowest moving glacier, covering large expanses of a continent. Glacial till: Rock and soil scoured from Earth and transported by a glacier, then deposited along its sides or at its end. Greenhouse effect: The warming of Earth's atmosphere due to water vapor, carbon dioxide, and other gases in the atmosphere that trap heat radiated from Earth's surface. Ice caps: Smaller glaciers that form in basinlike depressions in a mountain. Kettle lakes: Bowl-shaped lakes created by large ice blocks, which formed depressions in Earth's surface. Meltwater: Melted ice in the glacier's bottom layer, caused by heat that develops as a result of friction with Earth's surface. Moraines: Large deposits of glacial till that form hills. Piedmont glacier: Large, gently sloping glaciers found at the foot of mountains, which are fed by alpine glaciers. Surging: A sudden increase in a glacier's movement as a result of meltwater underneath decreasing its friction. Valley glacier: Glacier that forms at a high elevation in a mountain region and flows downhill through valleys originally created by rivers. Most glaciers that exist today are remnants of the last glacial period from 1,800,000 to 11,000 years ago. As glaciers advance and retreat, they plow through rock, soil, and vegetation like a huge bulldozer, altering everything they come into contact with. Ice acts like an adhesive, scooping up rocks and soil that add to the glacier's tremendous powers of erosion. Thus, a river valley that was once V-shaped becomes U-shaped; the rocks and soil carried with the glacier, known as glacial till, are deposited in huge mounds along the sides and at the end of the glacier, creating entirely new hills, or moraines. Chunks of ice buried in this till create large depressions that later became what are known as kettle lakes. Glaciers also scour the land to great depths, creating larger lakes such as the North American Great Lakes. During the last ice age, Earth's surface was depressed due to the weight of the glaciers. As the glaciers retreated, Earth's crust rose upward like a sponge. This crustal rebounding, as it is called, is still occurring at slow rates in parts of North America and Europe. Most glaciers move fairly slowly, only inches to a few feet per day. When large amounts of ice melt under the glacier as a result of friction with Earth's surface, the meltwater acts like grease to rapidly increase its movement. This sudden increase in speed is called surging. While the effects of glaciers tell us where they have occurred in the past, present glaciers are providing clues as to variations in climate over time and potential changes in the future. Scientists continue to debate the reasons why ice ages occur, but there seems to be agreement that glaciers increase on the planet when Earth rotates farther away from the Sun. When Earth rotates closer to the Sun, glaciers retreat. The U.S. National Academy of Sciences has predicted that if global temperatures rise from 1.5 to 5°F (0.75 to 2.5°C) over the twenty-first century as a result of the greenhouse effect, significant portions of Earth's glaciers could melt. (The greenhouse effect is the warming of Earth's atmosphere due to water vapor, carbon dioxide, and other gases in the atmosphere that trap heat radiated from Earth's surface.) Because glaciers hold 75 percent of the world's freshwater supply, such a meltdown would result in massive flooding of every continent's coastlines, drastically altering the shapes of every continent on Earth. Ice core samples taken from Antarctic ice also have provided evidence of Earth's climate over the last 160,000 years. Data has shown a direct link between warming and cooling trends and the amount of two greenhouse gases, carbon dioxide and methane, in the atmosphere. These same cores show significant increases in both gases in the past 200 years. Scientific reports issued at the beginning of the twenty-first century indicate that mountain glaciers from Montana to Mount Everest to the Swiss Alps were in a stage of retreat. In the Alps, scientists have estimated that by 2025 glaciers will have lost 90 percent of the ice that was there a century ago. Glacier melting, however, is generally quickest in and near the tropics. Ancient glaciers in the Andes have recently melted at an extraordinary rate. Between 1998 and 2000, one Peruvian glacier pulled back 508 feet (155 meters) a year. And Mount Kilimanjaro in the African country of Tanzania has lost 82 percent of the icecap it had when it was first carefully surveyed in 1912. At the current rate, scientists believe the icecap will disappear before 2015. Scientists theorize that all of these factors indicate that a global warming trend is taking place and that it is at least partly caused by gases released by human activities. what is the difference between glacial ice and regular ice? All of this info was really good for my project, and don't worry i made it into my own words. i really like this web site this works for my home work. When/if you drink glacier water will it drain your vitamins/minerals and why/how? Does glacier water have a sub-permeable membrane? or is it your body that secretes vitamins/minerals into the water till its equal causing in a loss off these minerals etc. in waste? what is the difference between drinking glacier melt and snow melt? and is there any other sights I could get this information off?